A child of the sixties, I believed at the time that activism centered around the power of the people who employed the in-your-face tactics we saw on the news or the protests we participated in on our college campuses. The civil rights and women’s rights movements particularly resonated with me as causes that just seemed right. As the nation approached its 200th anniversary, how could we continue to exclude whole segments of society from its promise of equality? Many times Joe Pratt and I have discussed with our Houston history students how we grew up hearing racist ideals at home but, like many in our era, came to reject them after seeing the injustices of segregation and the abuse of civil rights protestors who asked for nothing more than their right to vote. The nation’s culture exposed us to black athletes, writers, and musicians; but we were also part of the first generation of white Houston students to interact with African Americans in the classroom, and this clearly drove home the realization that racial superiority or inferiority was a myth. The sixties and seventies gave voice to the anti-Vietnam War movement as many of us questioned why our neighbors and classmates were being sent half way around the world to possibly die in war that seemed to lack a clear objective or relevance to our lives. Today, however, I know that social change takes place as a result of activism on many different levels and it is so much more than protesting. 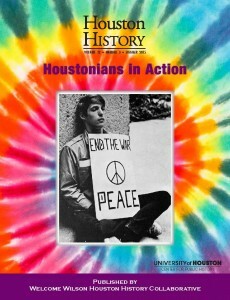 As the articles in this issue illustrate, activism encompasses local mothers’ clubs that raised money to improve their children’s schools, African Americans like the Hayes family who voted with their feet as part of the Great Migration in search of economic opportunity in Houston, participants in the Pride Parade who showed support for the LGBT community, families like the Fragas who worked for social and political change through institutions, as well as people like Maria Jimenez who have spent their adult lives organizing and protesting for equality. These groups and individuals represent but a few of the “Houstonians in Action” during the last century who were committed to social change and making our world a better place.